How can an artist create marks exhibiting human dimensions (i.e. they appear to be natural and authentic)? The following discussion addresses four ways artists can make marks so that they appear to be genuinely crafted by a “real” person (as opposed to being laid by a mechanical process or digital software). Arguably the easiest approach is all about the angle of the stroke. Let me begin by discussing how typical artists who do not have any physical or other impediments draw when unconstrained by a particular motivation. Right-handed artists make lines slanting like a keyboard’s forward-slash: “/.” Conversely, left-handed artists make lines slanting like a keyboard’s back-slash: “\.” Of course, both right and left-handed folk can choose to make marks angled in any direction they wish but here what I am talking about is what happens naturally. Consequently, the first consideration for an artist wishing to make marks that appear to be natural is to ensure that there is a general consistency in their angling. 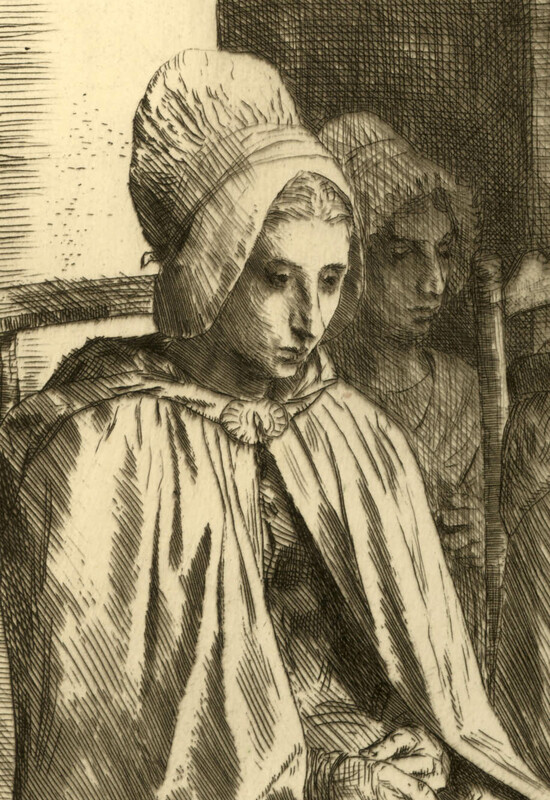 In the etching, Peasant Women in the Neighbourhood of Boulogne, shown below by Alphonse Legros, for instance, the angle of the marks is very consistent with those made by a left-handed artist. 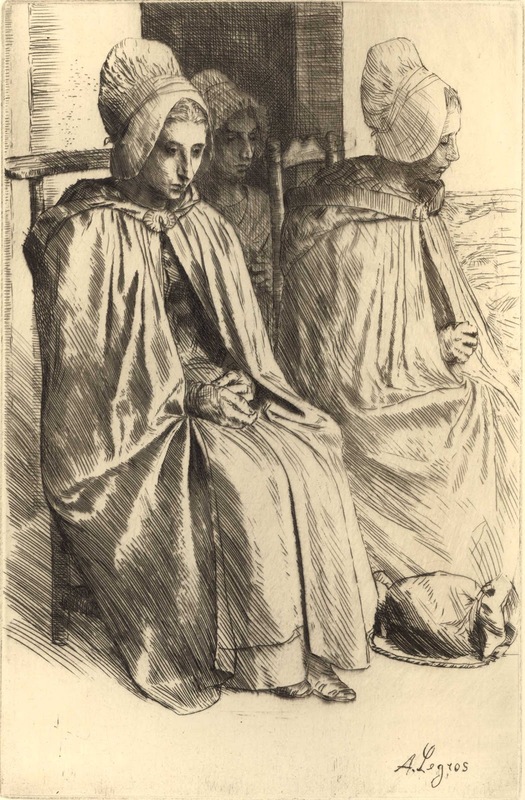 Such an interpretation, however, does not take into account that this print is a mirror image of how Legros originally drew his lines on the etching plate. Mindful of this technicality, Legros must have been a right-handed artist. Before moving to the next approach for connoting authentic strokes, I need to point out that although Legros’ print exhibits broad stylistic consistency, he (like all great artists) adjusts the angling of his marks according to the requirements of the subject and composition. For instance, note how the angling of the marks at the lower-left change to horizontal strokes at the upper-left and in turn connect with an area of cross-hatching at the top centre of the image. This transition in the angled alignment of the marks creates pictorial balance between the freely laid strokes portraying the two seated women with the tonally weighted “anchor” of carefully laid hatching portraying the dark doorway interior doorway behind them. Condition: pristine condition. 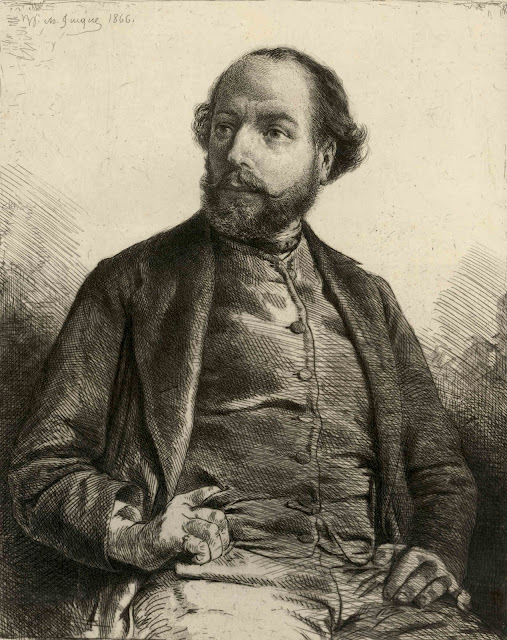 There are pencil annotations on the lower edge with details about the print and the date of publication at the top right. I am selling this print for $220 AUD including postage and handling to anywhere in the world. Please contact me using the email link at the top of the page if you are interested or click the “Buy Now” button. The second approach may seem at first to be 'far fetched' but from my studies it is helpful for projecting an intimate human scale in imagery even if it is at a subliminal level. Moreover, the principle underpinning this approach arose from my study of other artists’ drawings perceived to have this difficult to define attribute of human dimensions. This approach is simple to employ but more problematic to explain with a fully justifiable logic but I will do my best. In essence, the ideal size of mark embodying human scale in any rectangular image is one that is an eighth of the format’s diagonal length. 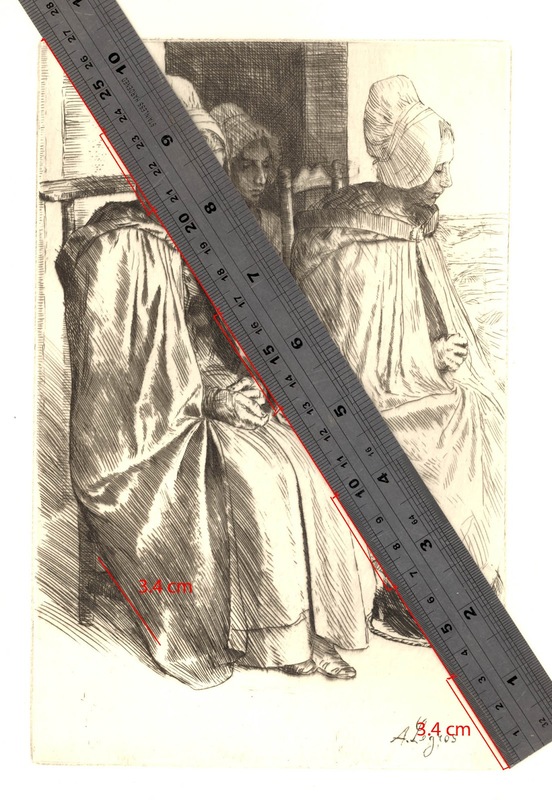 For example if an image is 22.5 x 15 cm (the same size of Legros’ print shown above) then the diagonal length is 27.3 cm (based on my ruler measurement). If this length is then divided into eighths then the ideal length of mark would be 3.4 cm (i.e. 27.3 divided by 8 equals 3.4). The image below shows a ruler placed along the diagonal with the 3.4 cm segments marked out. This ideal size of 3.4 cm for the Legros format does not mean that each mark should be 3.4 cm in length but it does give a measurement that at least I find satisfying as an average length. As a justification for this proportion, one can try out the following experiment. Fasten your wrist to a sheet of paper and, while holding onto a pen, mark the furthermost extremities that one can reach (see animation below). After defining the two marks, then relax the hand and establish the most natural (i.e. comfortable) length of line that one can then make. Hopefully the length of this natural line will approximate an eighth of the length between the two furthermost marks. 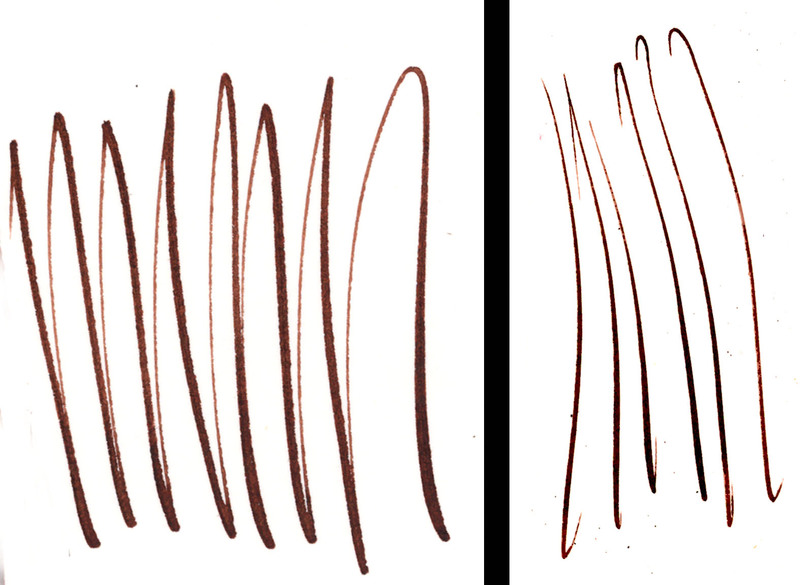 As a follow up to the last experiment, try fixing one’s elbow and replicate the same experiment (see animation below): first find the length between the furthermost marks that can be made with the elbow fixed and then compare this distance with an average mark of natural drawing strokes. Again, the proportion should be that the natural mark will be an eighth of the distance between the extremities of what is possible. This same procedure can be duplicated when the shoulder is then fixed and even when the pen is attached to a long piece of timber and held by the arm. In short the proportion remains the same. The very beautiful self-portrait etching by Charles Emile Jacque shown below exemplifies the above proposal of an ideal proportion of line but I now wish to discuss what may be an even more interesting phenomenon linked to this portrait: use of the return and hook strokes. 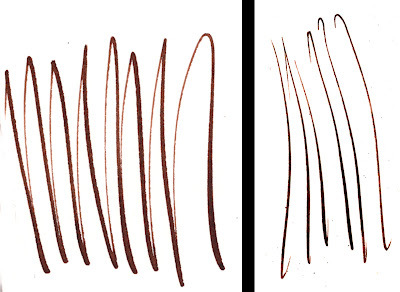 If there is one way to ensure that an artist‘s lines project a human dimension then use of these strokes are perfect for achieving this goal. Condition: Strong impression in good condition with minimal traces of foxing. I am selling this print for $230 AUD including postage and handling to anywhere in the world. Please contact me using the email link at the top of the page if you are interested or click the “Buy Now” button. The return stroke is a simple technique of not taking the drawing instrument off the paper, like the continuous scribble lines made by children, but with a difference. First, the artist makes a strong stroke. Next, this key stroke is followed by a more delicate return or connecting stroke that brings the hand back to the “starting” position for the next strong stroke (see the left image below). The history of this approach stretches back to Antonio del Pollaiuolo (1431–1498) in his famous Battle of the Nudes and his very deliberate emulation of this rendering style by engraving two sets of lines to “fake” the appearance of the return stroke. Interestingly, the hook stroke (see the right image below) may also be linked with Pollaiuolo but by default rather than by design. 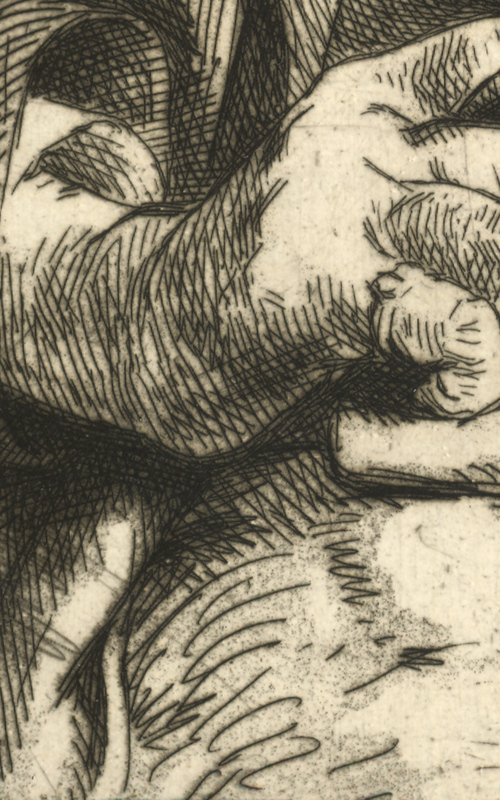 What created the hook stroke in his engraving is the gradual wearing away of the return stroke through constant printing of the plate to the point that only the hook at each end of the line remained. 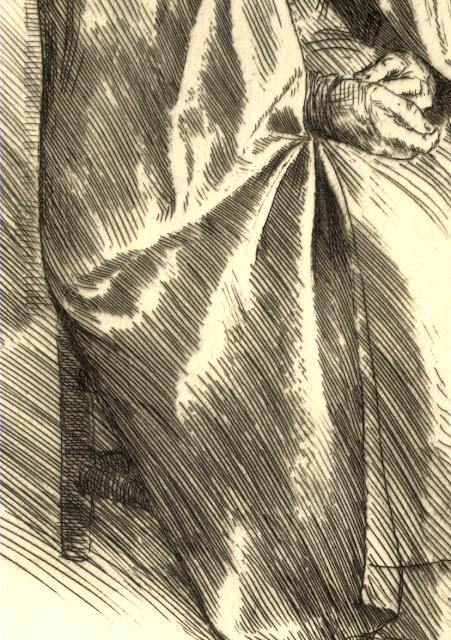 Certainly Francesco Rosselli (1445–before 1513) adopted this fascinating stroke as can be seen in his engraving, Haggai. 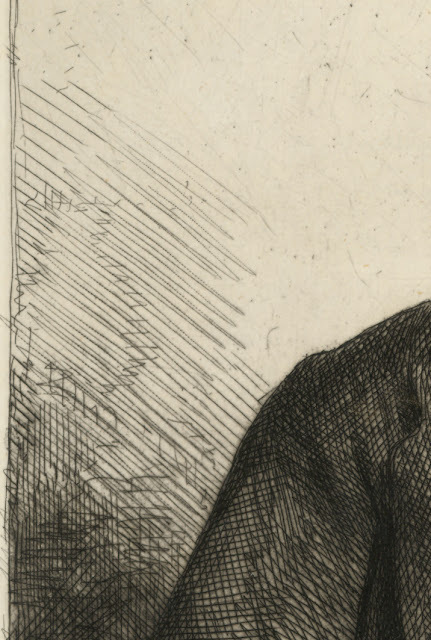 Regardless of where the stroke originated, however, this approach to mark making is one of the drawing styles that best exemplifies drawing naturally, confidently and with speed. In Jacque’s self portrait (see details further below) these attributes in his use of both strokes are clear. The fourth and final approach that I wish to discuss is the role that Golden Section proportions (a well-documented construct which I will be discussing more fully in future posts) can play in creating lines that appears to display human dimensions in terms of aesthetic sensitivities. Compare, for instance, a section of the return stroke shown below with the same section distorted on a Golden Section and how the swelling—at least from my standpoint—lends a sense of natural ease to the line. What is surprising about this simple arrangement is how effective it is in capturing genuine flow. Philip Rawson (1984) discusses the use of Golden Sections in the treatment of line in his marvellous book, The Art of Drawing: An Instructional Guide (see page 32).